Our list of streaming partners and voice assistants just keeps growing. Some names you will instantly recognise. Others may be less familiar, but still worth exploring. Remember, availability varies by region, so click the logo to find out what’s currently playing in your area. Amazon Alexa brings convenient voice control to your Sonos Home Sound System. Sonos One allows you start and stop your music with your voice. Amazon Alexa built right in. Or connect any Sonos speaker to an Amazon Echo or Dot over WiFi, and you’ve got instant, hands-free control of your favourite music and more. Free. Premium. Selected. On-demand. The list of streaming services on Sonos keeps growing. Some names you’ll recognise right away. Others may be less familiar, but still worth exploring. Remember, service availability varies by region so click for details to find out if it’s playing in your area. Already subscribe to a service? Great. Just add it to Sonos using the app, sign in, and play it out loud - for the entire house to enjoy. Spotify gives you access to any song, anytime, to any Sonos player in your house. Just search for an artist, album, or track and hit play. You can create playlists, or collaborate with a friend to make the ultimate mix. All you need is a Spotify Premium subscription. Google Play Music makes it easy to explore, share, store, and listen to your favourite music. Play millions of songs instantly from anywhere on any device. Get free cloud storage for up to 20,000 tracks, create custom radio stations, and enjoy smart recommendations that get smarter the more you play. Together we’ve created a whole new way to experience music. With SoundCloud on Sonos, hear millions of tracks from the world’s largest community of artists, bands, podcasters, comedians, and more in your home. Wherever you are, whatever you’re doing – SoundCloud lets you hear more. Upgrade to SoundCloud Go+ to access and stream an expanded catalog of more than 125 million tracks. From Chopin to 2 Chainz, we have all your favourite music ready to stream to every room in the house. Pick from over 43 million tracks, choose a playlist to fit your mood or kick back and let Deezer Flow blend old favourites with new music recommended just for you. Start your free trial now for ad-free music and great sound quality. TIDAL is the perfect match for Sonos, streaming music in lossless, high fidelity audio quality, ensuring the best sound experience possible. Add high definition music videos, curated editorial by music journalists, artists and experts, audio search, offline mode and much more and you simply have a superior solution to your music listening needs. More than 25 million tracks and 75,000 videos available. Enjoy. NTS is the world’s most authentic music platform for curated online music discovery. A global family of more than 500 musicians, artists, producers and music enthusiasts creates 24/7 radio programming with live broadcasts from London, Manchester, Los Angeles and Shanghai, as well as broadcasting remotely from events all over the world. NTS celebrates music culture and uncovers the best of the past and the present whilst cultivating the future of non-mainstream music and the scenes that surround it. With a growing international audience, nearly one million listeners are tuning in each month. 7digital’s store offers a catalogue of millions of high quality digital music tracks. Your purchases are automatically kept in the 7digital ‘cloud based’ locker for secure storage. You can access your music wherever you want and through multiple devices on any operating system. Simply sign in to stream all your 7digital music instantly through your Sonos system for a great listening experience in your home. Free Service. Add music to your day with Anghami, and make it louder with Sonos! With millions of Arabic and international songs, Anghami recommends music that perfectly suits your mood and taste. With Anghami’s Personal DJ, play the right music for your house party this weekend, or while cooking in the kitchen, or sleeping in your bedroom. Oh, and let’s not forget music while you shower! Music is in pure Dolby, so you can play top quality music on your Sonos. Audible offers the world’s largest selection of audiobooks. Enjoy award-winning performances from celebrities, authors and even full casts. Listen to your audiobooks anywhere, anytime — at home on your Sonos speakers or on the go with the Audible app — and never lose your place. Audiobooks.com provides the first on-demand streaming and downloadable service for audiobooks, delivering access on any Internet-enabled smartphone or PC, including Apple iPhones, iPads, Android smartphones or tablet devices, and now Sonos. The company is the first and only provider of Cloud Bookmarking, its proprietary technology that synchronizes users' last listened-to bookmark position across all devices. Find out more at www.audiobooks.com. Discover amazing new music and directly support the artists who make it. Create your own music collection, download or stream your purchases, and follow fans and artists whose taste you love. With a free Bandcamp fan account, you can listen to your purchases on the go via our apps for Android and iOS, or in any room in your home with Bandcamp for Sonos. Explore the #1 app for sleep, meditation, and relaxation. CalmRadio.com is an internet radio station specializing in Acoustic, Classical, Jazz, Ambient, Country, World Music as well as an extensive Classical Composers category. Plus! Enjoy our extensive selection of Atmosphere channels...especially crafted for sleeping, working ambience and for sufferers of ringing-in-the-ears or Tinnitus. We have one of the largest and most extensive selection of music channels anywhere...over 140 channels and more to come! All our channels are delivered to you in high resolution 192K CD quality sound. Listen to CBC Radio 1 and CBC Music (Radio 2) live. Classical Archives: the largest classical music site in the world! Classical Archives (ClassicalArchives.com) brings the largest collection of classical music recordings in the world to Sonos! This service offers almost 1.5 million tracks (90,000 albums) by 18,000 composers and 70,000 performers. Classical Archives is proud of the care and expertise with which our inventory is categorised. Our musicologists and computer scientists have developed a unique Contextual Metadata Engine which compares all incoming recordings to a canonical list of compositions. This allows all albums, works, movement titles, artists and composer names to be displayed and cross-linked with the care and accuracy classical music lovers expect. Unlimited streaming access is less than €8/month (or €80/year)! Listen to your favourite radio shows and stations whenever and wherever you want, thanks to DAR.fm on Sonos. Simply browse or search to find what interests you – sports, news, talk shows, and music – and DAR.fm will record and store them for you. Now you can tune in to virtually unlimited radio content in any room of the house—based on your schedule, not the station’s. Pause, rewind or fast forward to get to the good stuff. Free service. Available everywhere in English only. deliver.media professional music streaming services for POS and hospitality industry. Music genres or dedicated music streams. FIT Radio Workout Music: The only fitness app that provides you with non-stop, high-energy music of all genres designed to motivate your workout. Dubbed the "Pandora for gym rats" by Mashable, the app has been featured in SELF Magazine, Cosmopolitan, Forbes, Women's Running, Health, P90x and more. It takes a lot of time and energy to search for and download music for your workout. What you typically listen to throughout the day may not be what keeps you moving at the gym. With FIT Radio, manually putting together upbeat playlists for the gym is now a thing of the past. Thousands of mixes are all in one easy place for listeners to simply choose their favourite genre, push play and go! The music never stops – not even for ads – and we upload new mixes daily, providing users with hot tracks the moment they start exercising. Ideal for those on the move, FIT Radio gives smartphone and web users access to high-energy playlists in a variety of musical genres, offering a randomisation of 15–20 mixes in each genre at any given time. Using the smartphone app, FIT Radio users can stream a wide range of playlists of top 40, rock, hip-hop, house, EDM, indie, and more. All are updated daily! Each playlist is made by a professional DJ. Focus@Will: supercharge your brain! Reduce distractions while you work and study with this scientifically proven music streaming service. Multiple channels individually customised for your brain type, maximising your cognitive performance. Almost a million users agree: If you want to get serious about dealing with distractions, nothing compares to Focus@Will. 14-day no risk, free trial. Listen anytime to latest music albums, top charts, your favourites, your playlists and much more. Just subscribe to Gaana+ service and instantly stream your favourite music to any Sonos system in your house with Gaana. Listen live to Capital, Heart, Heart 80s, LBC, Classic FM, Smooth, Capital XTRA, Radio X and Gold, plus a selection of playlists curated to fit your mood. In a few words...Slow Music for Fast Times. Hearts of Space creates calming atmospheres with contemporary ambient and electronic music, plus orchestral adagios, ethereal ballads, transcendent jazz, sacred chants, and spatial sounds from around the world and across the centuries. Enjoy eight channels of carefully curated music, blissfully free from commercial interruptions, with or without minimal announcements. Ideal for any kind of concentrated or creative work. High quality AAC+ streams. Standard Service account required. Hotelradio.fm™ is a premium radio service targeted at the hospitality industry. With over 50 music stations to help set the mood there’s a multitude of station choices available to define an atmosphere: be it in a restaurant, hotel lounge, spa or even at home! Curated by professional DJs, hotelradio.fm’s music programming gives you the desired music mix when and where you need it, and it also offers the chance of individually programmed music channels for the ultimate customisation service. Since 2005, the Hype Machine's mission has been to help you fall in love with something new. We think the best way to find new music is just to listen to lots and lots of music—all kinds of it. That's why we don't use algorithms and we don't try to predict what you'll like—all we do is track hundreds of music blogs around the world. We present their posts in a single stream for convenient listening and easy discovery, and we let you find your favourites. It's free-form radio where bloggers are the djs. Their passion for music is your shortcut to hearing the next great thing, months before everyone else catches up. Start on the Latest Tracks channel—the newest music just hitting our site. Our community of over 1 million users favourite the tracks they like here, bubbling them up to Popular Tracks. You can heart tracks to My Favorites directly from your Sonos and join in. Explore the blogs in our listings at hypem.com, and subscribe to their posts to create My Feed, a stream of music customized just for you. Connect with your friends via Facebook and Twitter, and add their favourites to your Feed. Or listen to your favourite blogs via the Blog Directory—all posts from a blog, in a single playlist. There's a lot of music in here. Dive in. Hype Machine is only available on Sonos for SoundCloud Go users. Please visit here to link your Soundcloud Go and Hype Machine accounts. Discover classical music in lossless quality (FLAC). Listen to the latest albums, exclusive releases, and playlists created by our expert curators. Listen to more than 1,500 live radio stations from coast-to-coast including pop, country, urban, rock, talk, and college. Browse radio stations by music genre and location, and let our DJs know what songs are hot or not by giving them a thumbs up or thumbs down. Simply pick a song or artist to create your own commercial-free, uninterrupted Custom Station featuring music from that artist and similar ones. Choose from our catalog of over 18 million songs and 450,000 artists. Log in to iHeartRadio through email or Facebook to make iHeartRadio uniquely yours. Create, save, and share your stations from wherever you access iHeartRadio. With your LivePhish+ subscription, unlock the entire LivePhish catalogue. On-demand minutes after each show ends, stream professionally recorded multitrack mixes of every night of Phish Tour. Plus, dive into the Phish Archives too. Mixcloud helps you discover the world’s best radio in one place. Listen to music & talk radio programmes from our community of over half a million trusted DJs, radio stations, radio presenters and music tastemakers. Search for what you like or browse to discover new content through our charts, editorial selections and recommendations. Music is the most powerful artform in the world. At Mixcloud we believe that curation is art, not science, and we believe passionately in the power of expert curators and tastemakers to give you inspiration for your ears. Send your CD and vinyl collection to the future with Murfie. Murfie converts and securely stores your CDs and vinyl and provides you unlimited, high-quality streaming and downloads of the music you own and love. Add a Murfie HiFi membership for an exclusive, lossless streaming experience. Grow your collection on murfie.com and enjoy your new music instantly on your Sonos system. When away from home, stream your music anywhere with Murfie’s iOS, Android, and browser apps. Fire up nugs.net to listen to last night's show from your favourite bands. Join nugs.net's curated live music service to stream thousands of professionally recorded and officially released concerts. Listen to full shows on demand, make playlists of your favourite live tracks, read and post reviews, and save shows for offline playback. Sign up for a 7 Day Free Trial, and subscribe for €12.99/month or €129.99/year for unlimited access to current and archive shows from your favourite bands' tours. Tours include Pearl Jam, Bruce Springsteen, Dead & Company, Widespread Panic, Umphrey's McGee, Gov't Mule, moe. and many more. With Plex for Sonos you can now browse and play your entire Plex music collection on any Sonos device, straight from the Sonos app. All the podcasts you know and love and brand new ones to discover all in one place. Qsic is the world's only commercial music streaming service with built-in AI to positively influence your customers' mood, mindset and behaviours. Top-quality radio broadcasting online with a unique system that combines excellent Stress Relief Music and Relaxing Music with Natural Sounds. With Radio Javan, enjoy the best in Persian music with access to all the newest songs. Search for your favourite artists and music hits. Radionomy.com is an online radio platform featuring a wide variety of music and themed radio stations to discover and listen to for free. Browse through our directory classified by genres and find the perfect radio station according to your mood - or simply create your own radio station in a few clicks on radionomy.com and listen to it on your Sonos device! Radionomy is one of the largest user generated online radio networks in the world with thousands of radio stations managed by real passionate people. Tune in to one of the stations, sit back and relax! radioPup is a personalized radio app featuring 300+ live & local radio stations streaming the best music and news available powered by the 3rd largest owner of radio stations in the US, Townsquare Media. Covering many genres including: Country, Classic Rock, Hip-Hop / R&B, Pop, Lite Sounds, Sports, News/Talk, Classic Hits, Rock and more. Browse through all of the available stations by location, genre or recently added stations. radioPup is the radio app that follows you everywhere. Take radioPup wherever you go with our iOS and Android apps. Free music service with no sign up required. Enjoy dozens of free different genre channels and music festival live streams from all over the world! Red Bull Radio broadcasts handpicked music and in-depth interviews with influential artists from around the world. Get instant access to over 25,000 classic old-time radio shows from the 1930s, 40s and 50s. Includes detective shows, thrillers, drama, comedy, science-fiction music, variety, westerns, juvenile and so much more. There really is something for everyone. Search for your favourite series, shows or stars. Create playlists to enjoy throughout the day. RUSC Old Time Radio is a wonderful resource that is guaranteed to bring hours of listening pleasure whether you are 9 or 90. Simply choose a show from your favourite category, put your feet up, and be transported back in time to a world when radio ruled the airwaves, and when good clean entertainment enthralled the nation. If you love audiobooks or audio drama then RUSC Old Time Radio will be like an Aladdin’s Cave of audio treasures from days gone by. Saavn is the best Bollywood and Indian music listening experience, online and on the go. It's a beautiful and easy way to search, discover, and listen to over a million songs, from the latest hits to hard-to-find classics. Saavn brings you the best music, trending songs, and personalized radio in Hindi, Telugu, Tamil, Punjabi, English (India Only), Kannada, Marathi, Malayalam, Gujarati, Bengali, and Bhojpuri. Save playlists and favorites across genres like film, devotional, bhangra, bhajans, ghazals, and more, and access your favorite music through your existing Saavn Pro account. Business never sounded so good! Whether it's in an office or a restaurant, a retailer or a hotel, background music enhances both the customer and the employee experience. Hundreds of stations and millions of songs, including the ability to create artist stations, so you can design the perfect sound for your brand. Fully licensed for business environments. With Soundry you can play music in your business easily, affordably, and legally. Play curated playlists packed with royalty-free music. Listen to radio shows, podcasts, talk shows, news and sports – all on Spreaker. Spreaker connects you with the voices of people from all over the world: hear their stories live, or listen later as podcasts. Tens of thousands of shows available in every room of your home. Free Service. Curate your own personalised list of podcasts and tune in to the most up-to-date content in business, sports, politics, and entertainment from brands like NPR, CNN, BBC, Adam Carolla and more. Pull together your favourites from over 5000 podcasts, radio shows and stations to create a custom playlist, or allow Stitcher to recommend shows based on past listening. Stream it throughout your house on demand. Free service. 100% Legal. Curated Channels. No Licensing Hassles. Setup in Minutes. Swedish Radio in your Sonos-system. Listen to our live channels for example P1, P2, P3 and P4 or explore our 400 radio shows. Tribe of Noise offers an innovative background music service for businesses, without the need to pay (annual) fees to national collection societies. This cloud music service will help businesses to create the right ambiance for their clients and staff. All rights included music. No need to pay to national collection societies. Your subscription covers everything. Wide variety of songs selected and updated by our music department. Choose between 3 different music channels depending on which ambience you want to create. No ads, 100% music, 24 hours a day. Being different – a fine selection of modern music from emerging artists, in your shop, store, restaurant, gym, etc. Listen live to any station across the Triple M Network for Rock, Sport & Comedy. Featuring your favourite shows like the Hot Breakfast, The Grill Team, Rush Hour and The Rub. Stream over 20,000 live concert recordings featuring the world's greatest performers with your Wolfgang's AMP'd membership. Worldwide FM is a unique radio platform exploring arts, music and culture from London, Berlin, Tokyo, Kyoto, Los Angeles and beyond. 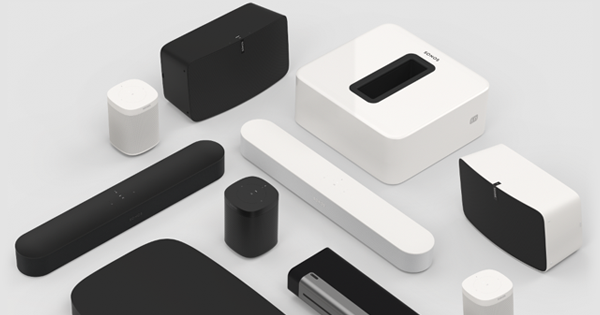 Sonos plays everything – the most popular streaming services, on-demand services, internet radio, your favourite podcasts and audiobooks, your go-to collection of downloads – whatever you love to listen to. With Radio by TuneIn on Sonos, you’ll have instant access to over 100,000 local and international radio stations, shows, and podcasts streaming from every continent. All for free. Browse for stations or type in specific call letters or a podcast you love. Play music from every PC, Mac, and storage drive on your home network. Up to 16 sources. And all those songs on your smartphone, too. Choose “On this phone” in the Main Menu and listen to your heart’s content. Sonos can access files shared from a PC running Windows 7 and higher, Mac running OS X 10.9 and higher, or a Network Attached Storage (NAS) device that supports the Common Internet File System (CIFS). Sonos supports the playlists that you've created in iTunes, Windows Media Player and services like Amazon Music, Apple Music, Deezer, Google Play Music, SoundCloud, Spotify, TIDAL, and more. JPG, BMP, GIF and PNG formats are supported up to a resolution of 1024 x 1024. Sonos supports MP3, AAC and WMA streaming audio formats for Internet radio stations. * It is important to note that Digital Rights Management (DRM) protected content is licensed for use in the program in which it was purchased. If applicable, you can upgrade the content via the licensed program to remove this protection so it can be used on Sonos.